After 28 days at sea, Jewel arrived safely in Cochin, surrounded by welcoming ships. 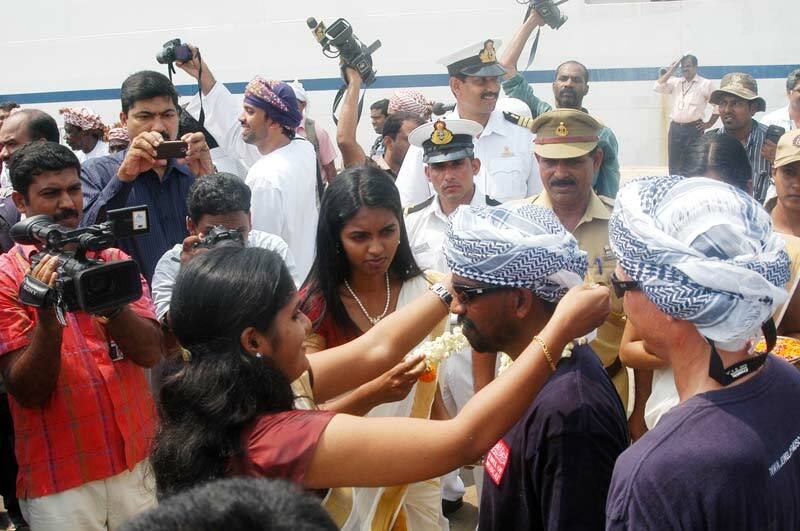 Dignitaries from Oman and India greeted the crew before dancing and celebrations broke out on the quayside. Jewel’s crew, relieved to be on land again, were greeted as heroes and welcomed with warm hospitality at a series of events. This was to be the hallmark of all Jewel’s stops during her voyage. The voyage of Jewel of Muscat embodied an eternal symbol of the ancient links and the longstanding friendship between Oman and the peoples of the Indian Ocean rim. Jewel of Muscat also underlined the positive interaction between the Sultanate of Oman and other civilizations and cultures. It thus came in the context of Oman’s ancient history and celebrated a cultural legacy of which Omanis are proud. During her stay in India, Jewel was taken into dry dock for maintenance and repairs. The construction team found that the 9th-century design was holding up well and once her traditional anti-fouling of chunam (a mixture of animal fat and lime powder) had been replaced she set sail on the second leg of her voyage to Galle in Sri Lanka.